by Carolyn Podruchny. Softbound, 414 pages, 6" x 9". 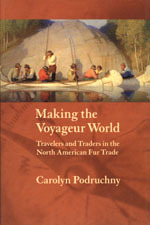 The author looks beyond the stereotypes of rugged and merry heroes and shows that the voyageurs created distinct identities shaped by their French-Canadian peasant roots, the Aboriginal peoples they met in the Northwest, and the nature of their employment as indentured servants in diverse environments. Identities were also shaped by constant travels and by their own masculine ideals that emphasized strength, endurance, and daring This book underscores the impact the voyageur had on the social and cultural landscape of North America.